Ending a relationship is never easy, it’s stressful, unpleasant and sometimes complicated. There are a few simple ways you can help to make the change in your life easier for you and your partner to cope with. Many people shy away from breaking up by letter. There are well-documented instances where people have been devastated after their relationships were ended by phone, text or email. However, there is an argument for ending a relationship by letter. A letter gives you time and space. Ending a relationship is fraught with reasons, emotions and sometimes accusations. A letter helps to smooth the immediacy of these strains. Setting all these points into a letter allows you to think things through and record all your thoughts and emotions without making mistakes. You will be able to make yourself clear using the right words and avoiding the wrong impression. Ending a relationship by letter helps you to get the tone of whatever you have to say just right. Your letter needs to give the reader the impression that what you have to say has been thought through and written with care. Start your letter by getting straight to the point and saying why the relationship is ending. Be honest and be clear, this is much easier to appreciate than a string of sentimental waffle that never gets to the point. Keep the tone of your letter humane and compassionate. This is a hard time for you both and it’s not the time to vent any anger or accusations. Balance all the bad news with some positive comments and reminders of the lovely things you have enjoyed together in the past.Before ending the letter, be clear about any practical considerations such as collecting personal property or reconciling any financial matters. End your letter with happy thoughts and wishes for your futures. Don’t waffle. Your ex-partner will think you have something to hide or they may even lose interest! Never use clichés, like ‘we’ve grown apart’. It just sounds lazy and insincere. Never type your letter. It must be handwritten. This shows you have taken time and care over the task. Only post the letter if you are physically unable to hand deliver it. Letters ending relationships are much more effective and less painful if they are delivered by hand with a few kind words, face to face. Avoid accusatory sentences. Instead of saying ‘you made me sad when...’ say ‘I felt sad when you went away without me.’ You are explaining your emotions and the causes but you aren’t directly accusing. I am so sorry I have to write this letter. It was good to see you today and I was glad we were able to discuss our future. I hope this letter will properly explain why I think we have arrived at a point in our relationship where I believe it’s time for us to separate.Our first year together was wonderful, wasn’t it? I have such happy memories of our trips and holidays together. It was all such an adventure. I suppose when we got home and rented a flat together, everything seemed to change. It’s one thing being together on one long holiday but it’s quite a different thing when you have to take on all the stresses and strains of ‘real life’. When we both started working longer and longer hours, we seemed to forget how important it was to have some fun and enjoy shared hobbies or interests. Before we knew it, we reached a point where it was impossible to recover that lovely relationship we once had. Finally, I couldn’t help but feel disappointed when you snapped up that promotion. Although, I was very pleased for you, I knew it would mean even less time together. I realise this is a painful letter to read and I want you to know that when I think of you, I still smile and remember the good times, above anything else. I wish you happiness and peace for the future and I hope that with time, we can be friends again. 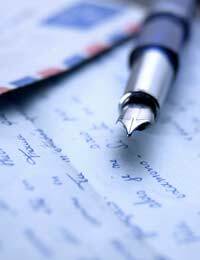 Letters can be a valuable part of the process of ending a relationship. They allow you to say all the things you need to say, in the most appropriate way. A good letter will be clear, firm and kind. It’s a very tough time and your letter should help to smooth away some of the pain and confusion for both of you. I need help writing a notice go change my son's name.His last name is hyphened with both of our names and I would like to have his name removed. My son is 4 and his biological father has had no contact for the past 3 years.I have a younger son and I would like their names to be the same as mine.